The American Association of Orthodontists advises all children get an orthodontic evaluation by age 7 so problems are tackled while the jaw is still growing and tooth movement is fluid. Adults desire straighter and healthier smiles, too, and more and more Americans over the age of 21 currently seek orthodontic care. How can they pick the right doctor? What’s the goal of orthodontic care? Poorly aligned teeth cause several problems. The most obvious is poor personal appearance. Crooked teeth generally lead people to cover their mouths in embarrassment and to project less approachable and less confident personas. Bad bites mean less than perfect oral health as well. The American Dental Association maintains that crowded, overlapping teeth decay more easily simply because they are harder to floss and brush. Poor hygiene contributes to the number one cause of tooth loss in the United States: gum disease. Also, people with crooked smiles are more subject to bruxism, or teeth clenching and grinding, headaches, earaches and TMJ Dysfunction. So, orthodontics aim to straighten teeth to improve appearance, self-confidence and oral health and function. When you select a orthodontist for yourself or a loved one, be sure he or she considers all aspects of this important restorative and cosmetic dental service. Your Canton dentist, Dr. J.D. Robison advises doing research before settling on where you will get Canton braces. Regarding academic preparation and training, orthodontists complete 4 years of dental school and 2 or more years of advanced training in orthodontics. Contact your local dental society or the nearest university dental school for names of dental specialists in your area. Finally, take time to interview more than one doctor. Many orthodontists do low cost or pro bono consultations. Be sure you feel comfortable with the dentist, his or her staff and the general office environment. You should understand fees, goals of treatment and approximate treatment time before starting the actual process. 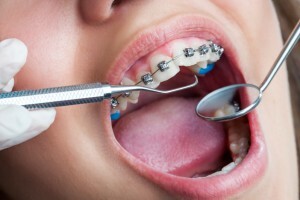 And, when it comes to dealing with the substantial cost of braces, ask about ways to finance it. For example, Robison Dental Group takes cash, major credit cards, check and CareCredit. Are Canton braces in your future? Think ahead, and select your orthodontist carefully. Plus, feel free to contact Dr. J.D. Robison for an orthodontic consultation. Providing traditional braces and innovative Invisalign clear braces for patients of all ages, Dr. Robison and his team would be honored to speak to you about the benefits of orthodontics.